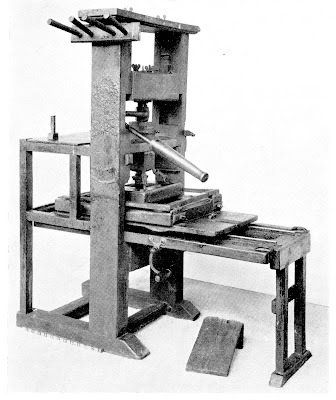 After many years’ planning and preparation, I’m setting up a full-size 18th Century style wooden Common Press (similar to the one shown above) in Lewes, Sussex (home of the Lewes Arms pub, Harvey’s beer, the Headstrong Club and many other good things). The press should be up and running by early 2009, and be printing away producing material for the bicentenary of Paine’s death in that year, when a big commemorative festival will be held (4th to 14th July) in the town of Lewes. THE TOM PAINE PRINTING PRESS is my project to set up a working press, as used to print Paine’s massively influential pamphlets and books – Common Sense, The Rights of Man, The Age of Reason, etc. Erected in the environment of an 18th century print room in Lewes, together with type cases, cabinets, frames and the compositor’s ‘stone’, this will be a working press available to contemporary artists and writers to print their own work. It will be capable of woodblock, lino and other relief printing, and of printing letterpress items. It will provide an excellent educational resource and tourist attraction for Lewes. Posters, broadsheets, pamphlets and books will be printed on the press, which will also be used to instruct students of all ages in the complexities of letterpress technology and the crucial importance of the printed word in disseminating ideas. I practise as an artist, writer, printmaker and producer of artists’ books (see link to my blog). I’ve also been a member of the Headstrong Club for 21 years (it was founded in 1987 to commemorate the 250th anniversary of Paine’s birth in 1737), latterly a committee member, and was a founder member of the Tom Paine Project, for which I curated four simultaneous exhibitions in Lewes and an American Revolutionary War re-enactment at Firle Place, in the year 2000.